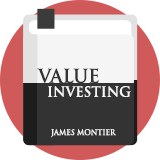 James Montier Cooking the Books is a short selling strategy based on research by economist and equity strategist James Montier. It uses Low Quality criteria to identify stocks that could be at risk of bad accounting practice. The 6-point C-Score checklist looks at the divergence between net income and cash-flow, increasing days sales outstanding, increasing days sales of inventory, increasing current assets to revenues, declining depreciation relative to property, plant and equipment and high total asset growth. Montier found that the C-Score was even more effective when used to assess stocks that look over-valued on a price-to-sales ratio basis. James Montier wrote: "In good times, few focus on such 'mundane' issues as earnings quality and footnotes. However, this lack of attention to 'detail' tends to come back and bite investors in the arse during bad times." Montier found that stocks with a C-score of 5 and a price-to-sales ratio of greater than 2 tend to generate a negative absolute return of 4% per year. Short selling shares can be very risky but the C-Score can still be used as an indicator of which stocks should be avoided.